To better understand the current fare collection challenges transit agencies are facing, we conducted a survey in partnership with The Transit Wire. The survey was geared toward transit agencies and the consultants who work with them. Over 100 transit professionals completed the survey. The majority of respondents (71%) worked at transit agencies, 23% were consultants, and 6% worked at other government agencies. The survey presented a list of potential challenges and respondents were asked to select as many as applied to their agency. Most respondents indicated that their agency encountered multiple challenges, and 71% identified at least three issues. Major concerns focused on the cost of upgrading or maintaining a fare collection system, cash handling, fare evasion, and managing expectations. 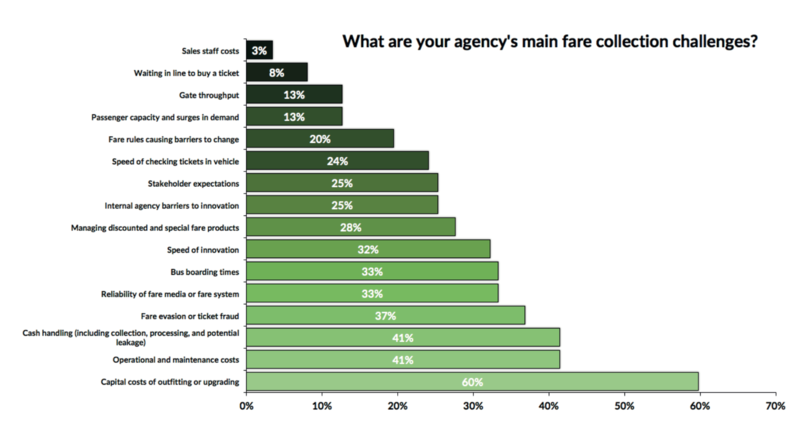 The capital cost of introducing or upgrading a fare collection system was by far the most commonly cited concern, with 60% of respondents saying that this was a challenge for their agency. And the costs don’t end with installation. Respondents cited concerns over the operational and maintenance costs of legacy fare collection systems (41%). Depending on the extant technology, agencies may have to maintain turnstiles, fareboxes, and ticket vending machines along with the software that supports the fare system. One in three respondents (33%) identified issues with reliability of fare media or the fare system, both of which clearly affect the costs of maintaining the payment system. As these comments suggest, fare technology and customer expectations are changing faster than some transit agencies can keep up. The full results of this survey are featured in The Transit Wire Research Report: The State of Transit Fare Collection. To download the report click on the image below.